Testing the Prestige 590 reveals the secret to the builder's success. 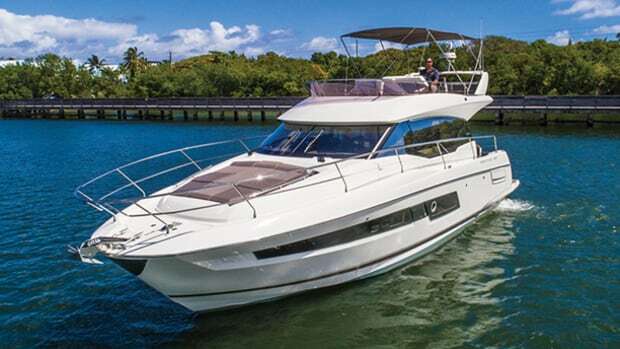 At an owners’ event in Key Largo, Prestige offered sea trials of their new 590 and insight into their success. A 14-year-old Prestige 46 enjoys a long winter’s nap under the warm Florida sun. The grill, PWC, windshield and bimini are covered and cinched tight but otherwise she looks ready for open water. 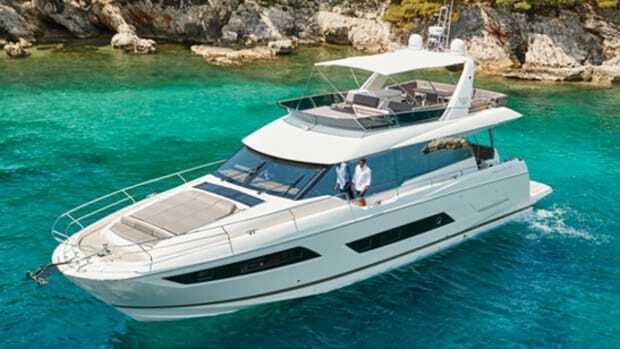 Directly across the dock, coincidentally, is a new Prestige 460. 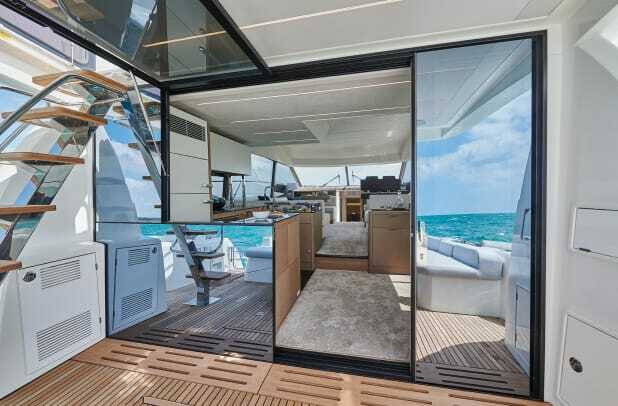 It’s an interesting juxtaposition to find during the builder’s annual Sea & Shore event—one in which a select group of discerning owners are invited to Key Largo’s Ocean Reef Club to view the new model lineup and mingle with fellow owners. This time, the event also serves as the kick off to the brand’s 30th anniversary celebration. After taking a lap through the 460, I step aboard Prestige’s newest model, the 590. Anytime I climb aboard a new boat I try to pretend I’m in the market for a similar type boat. (I’ve been told I have a strong imagination.) But this time it’s even easier to imagine myself as a Prestige owner; I’m joined by my wife, Karen. We sip coffee, stroll the docks and climb through various models. She shakes her head in disbelief that this is my job. I don’t mind; I do the same thing myself from time to time. I’ve toured half a dozen new models with top brass from Prestige over the years. Together with President of Prestige America Nick Harvey and Director of Marketing Erik Stromberg, I’ve been through more than my fair share of engine rooms and bilges and have come away with a high level of respect for the attention to detail they pay in designing a boat that uses the most of every inch of space, while also paying fanatically close attention to their boat’s center of gravity. 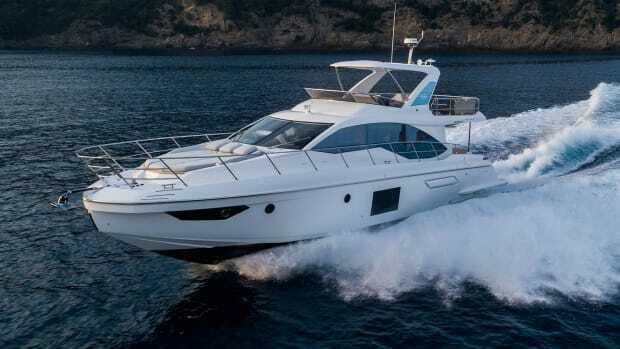 I’m impressed with myself (remember: Mr. Strong Imagination here) as I explain all this to Karen and teach her what I look for when reviewing a boat. I show her how closet shapes and clever drawer solutions give the owner every inch of usable accommodation space. I note smart handholds and sightlines, and how the side door assists in docking while shorthanded. 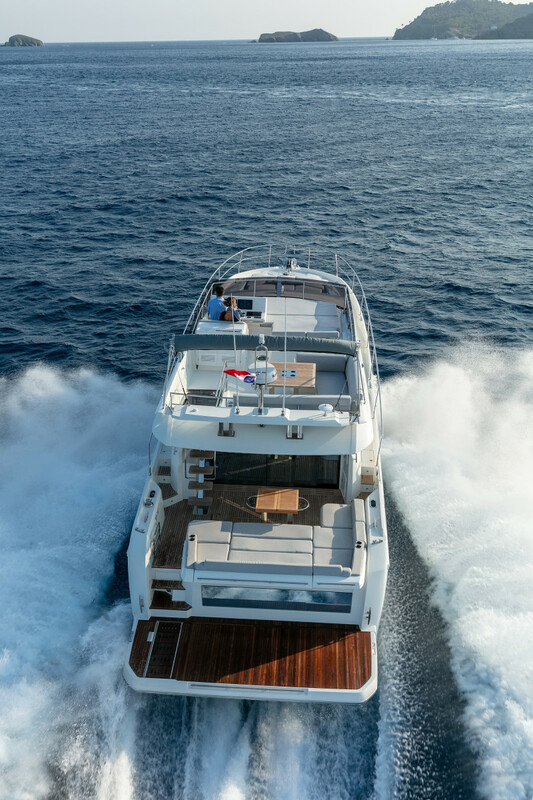 She mentions how much she likes the boat’s aesthetics and the amount of space there is in the full-beam master. She takes note of the seating area to port in the master that allows you to enjoy a cup of coffee one second and a flip-up vanity to do your makeup the next. She gives it the kind of look that leads me to believe I have a new home project in my future. 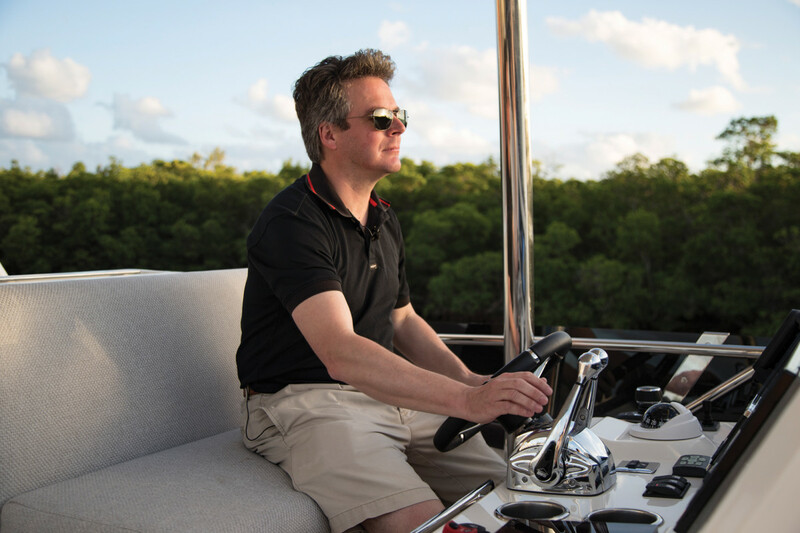 Erik Stromberg eases the 590 through the narrow channel of the Ocean Reef Club. These trials provide him with plenty of design feedback. We make our way to the helm where I mention the 590 incorporates a digital switching system called Ship Control. 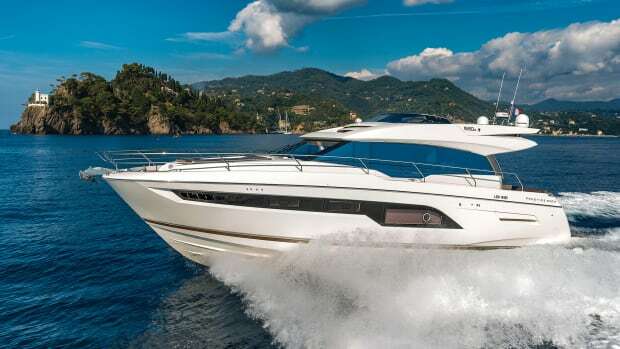 “It actually debuted on the Beneteau GT 50 last year, and that boat had first dibs, but since Prestige and Beneteau fall under the same parent company, eventually that technology made its way to the other brands.” Karen’s eyes glaze over and I realize I would not make a very good broker; I’m losing my client already. “OK—to the point,” I pivot to salvage my imaginary sale. 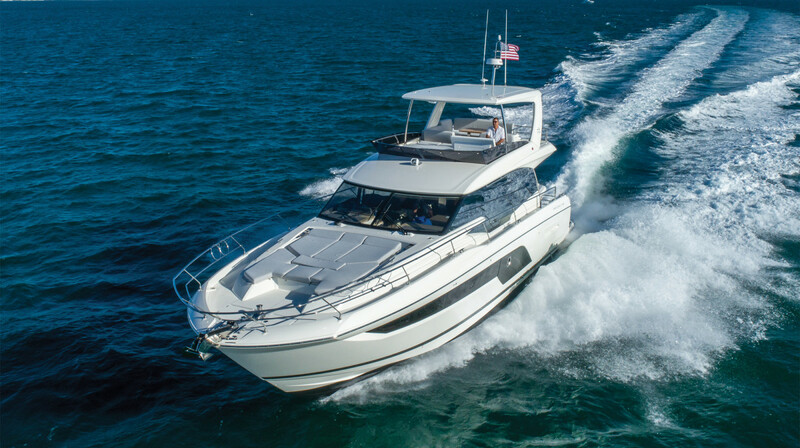 “It allows me, with just a couple swipes, to control every system on the boat and it’s really easy to use. Like lighting for instance. Instead of walking around the house to turn off all the lights you leave on, if we had Ship Control at the house, I could simply turn them all off from one location.” She gives me the kind of look that leads me to think my new project is finding a new home. Luckily for me, an actual team of sales professionals come to rescue me from a hostile client. 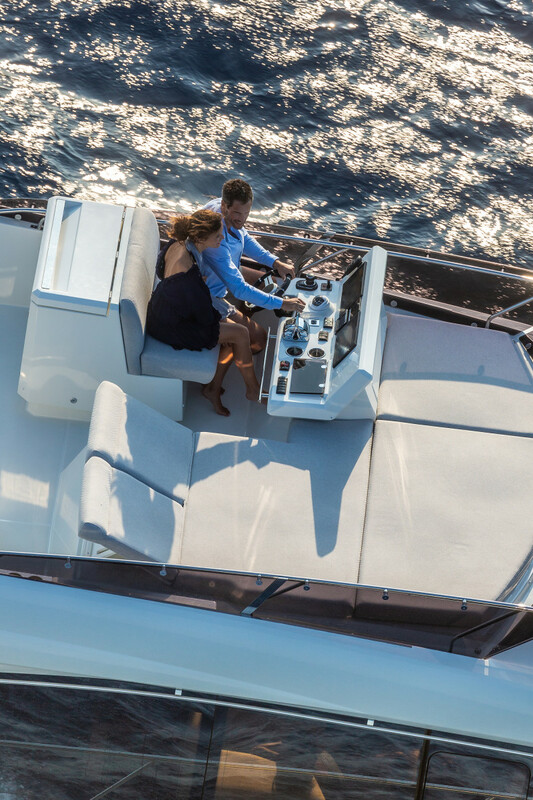 It’s time to free the 590 from its chains and take her for a spin on sun-drenched water off Key Largo. I’ve tested boats from the Ocean Reef Club before and I always enjoy the short hop to open water here. You have to narrowly pass the club’s private beach and infinity pool. Seeing people clamor for their phones, pucker their lips and angle themselves for the perfect selfie with the boat in the background makes me wonder what our society has come to. Past the selfie paparazzi is an arrow-straight channel and the end of the no-wake zone. 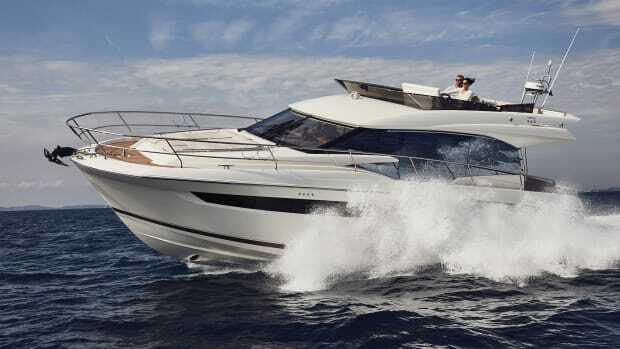 Stromberg, who introduced me to the 590 when she debuted at the Cannes show last fall, is eager to show me what this boat can do. We settle in at the flybridge helm and carve turn after turn. The 590 is sporty in the best way. To record more precise test data, we retreat to the lower helm for two-way speed runs. I’m more than happy to hand off the task of recording data to Karen, who I have to admit has much better handwriting. 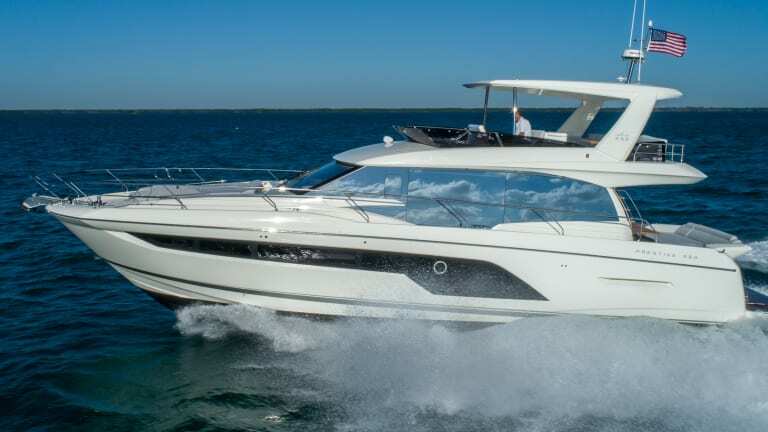 The boat is snappy and fairly silent, with just 71 dB(A) of noise at a 29-knot wide open throttle. I’m fairly content staying behind the helm; the stress of a looming, hectic holiday melts away with every nautical mile we tick off. But I know that wouldn’t be very broker-like of me. So I let Karen take a turn. I recognize the mixture of nerves and exhilaration on her face as I coax her to push the throttles toward the horizon. 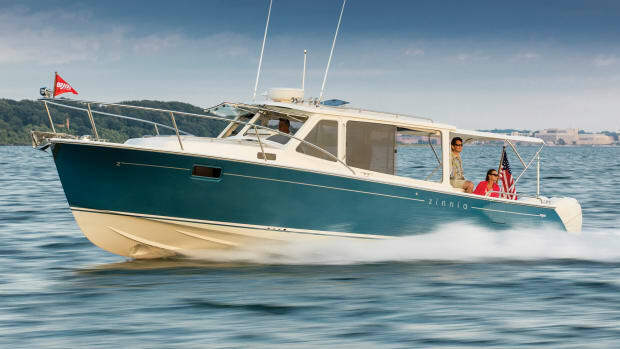 Automatic trim and joystick technology have her moving the boat around like a pro. Sitting there and keeping a lookout, I think about how amazing it is that such a complex little ship with countless systems could be operated so simply. I’m sure most children over the age of 10 could learn to operate the 590’s Ship Control system in no time flat. 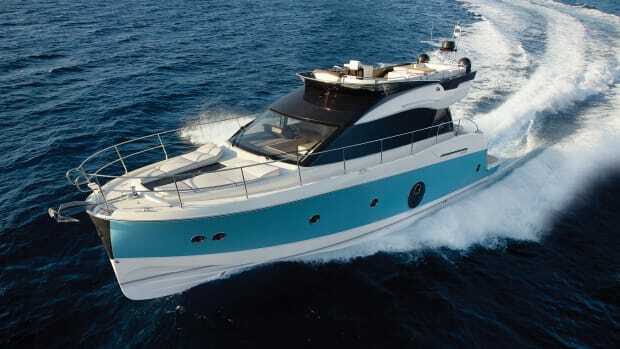 Before long we return to the Ocean Reef Club; the 590 is a popular girl with a full dance card. There’s no more imagination left to muster. The Sea & Shore event is coming to an end; I’m no longer an imaginary broker or a pretend Prestige client. Karen and I take some time to relax poolside before one of the many social events the company will host. We watch as a parade of Prestige models pass by. One after the other, we see how each boat shares similar traits with each other. They’re different sizes and debuted in different years, but like the 46 I saw earlier that morning, they are undeniably Prestiges. 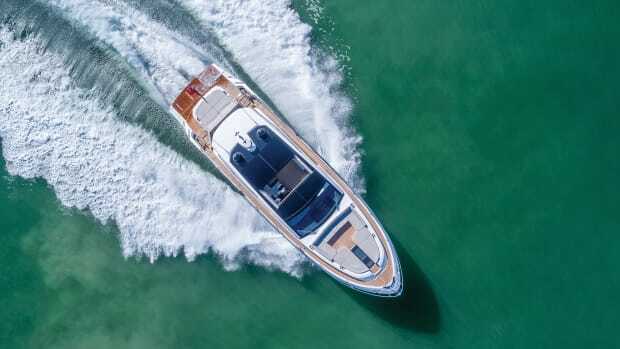 Stromberg has a vigorous travel schedule that includes boat shows around the world, so I always try to pick his brain about what trends he’s seeing in boat design. “What’s sometimes tough to decipher is a trend from a gadget. You could say that we’re seeing a trend toward more integration,” he says. 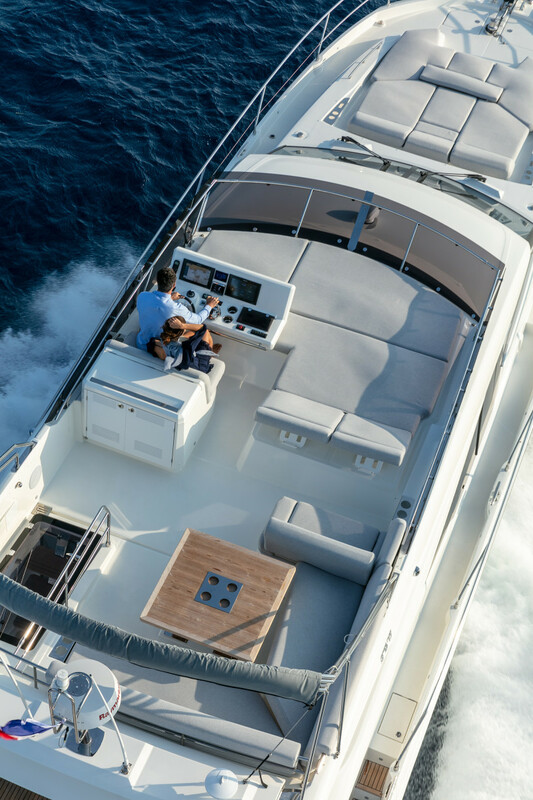 Perhaps nowhere is this level of integration more apparent than in the company’s recent partnership with FLIR/Raymarine to incorporate DockSense, a new dock-assisting technology that is poised to change the way people use their boats. 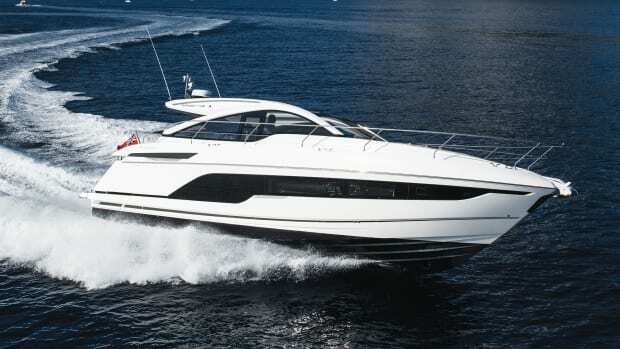 Prestige has certainly turned many pages of design over the years, constantly evolving their boats and brand. Focusing on the future has always been their strength. Turning 30 is as good a time as any to reflect on where you’ve been and where you’re going. I have a feeling that the next 30 years of Prestige will be even more memorable than the first. Test Conditions: Seas: 1 ft. The level of a normal conversation is 65 dB(A).